IIIT Basar RGUKT 2018 Results, Selection List | Shortlisted candidates list download manabadi IIIT RGUKT 2018 Results, Selection List/Shortlisted list for RGUKT BTech Degree Admissions 2018 RGUKT IIIT Basar BTech Degree Admissions Selection List, List of candidates provisionally shortlisted for UG Admissions 2018-19 Rajiv Gandhi University of Knowledge Technologies, Basar for admission to first year of 6-year integrated B Tech Degree programme lection List/Shortlisted, RGUKT Telangana Integrated B.Tech Admissions provisional selection list 2018|TS RGUKT IIIT Basar results.TS RGUKT Integrated B.Tech Program Admissions 2018 Notification selections, Telangana RGUKT IIT 6 year B.Tech degree admissions 2018 notification results. Online Appilcations Process completed for Triple IT /IIIT Basar 2018-19 Admissions. The selection list will be available online on 12th of this month, Counseling will be held on June 19 and 20, and classes will start from July 1 get the complete details from here. Rajiv Gandhi University of Knowledge Technologies(RGUKT) Telangana State has released the Admission notification on April 2018 for the session 2018-2019. Online Applications are invited by Rajiv Gandhi University of Knowledge Technologies, Basar (Telangana State) for admission to first year of 6-year integrated B.Tech program for the academic year 2018-19 between the 28th April 2018 to 29th May 2018. Now online submission is over candidates who had applied to Rgukt basar iiit are waiting for anxiously for Rgukt basar iiit selected list 2018. Regular students who passed SSC or its equivalent examination (10th class) held in 2018, in the first attempt and Age not more than 18 years as on 31.12.2018 (21 years in case of SC / ST candidates) are applied for this stream. So wait is over Rgukt officials to be released 1st round selected list on June 2018 on it's official web portal http://admissions.rgukt.ac.in. The list of admission to the 2018-19 academic year at Basara Rural Engineering is to be released on 14th June 2018 Thursday. 2. Click on the link Provisionally selected List. 3. The list of the selected candidates will be displayed on the screen. 4. Check the list and save it for further reference. IIIT RGUKT Basar 2018 Results, Selection List/ iiit shortlisted candidates list 2018 results download here, the results will be announced on 14-06-2018. TS RGUKT IIIT Basara Final Phase Provisionally Selected List,Shortlisted under Unfilled Seats , Waiting List download . #Rgukt basar officials has released the Rgukt basar iiit selected list 2018 , iiit results manabadi . Selected Candidates can view the list of provisional allotment for Rgukt basara iiit admission for the academic year 2018-2018 here the list given below. Here is the list of candidates who have been selected provisionally for Rgukt basar iiit 1st year B.Tech course. 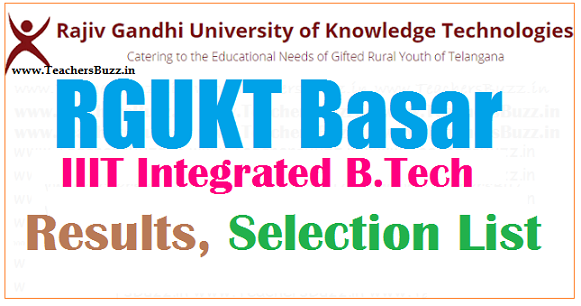 Rgukt basar iiit selected list 2018 iiit results download.